Rugby 365's Jan de Koning spoke to the CEO of SARU, Johan Prinsloo. 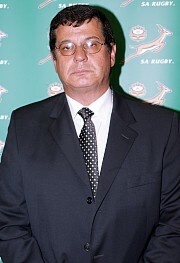 Visit www.rugby365.com for comprehensive SA rugby news. The Springboks finished the year at No.2 on the International Rugby Board (IRB) rankings. But in the boardroom things did not always go as well. It was indeed a year of mixed emotions, absolute highs and lows. Rugby365 spoke to Johan Prinsloo, the CEO of the South African Rugby Union (SARU) and asked him about his five biggest highlights and five biggest disappointments for 2005, as well as his 2006 wish-list. 1. The commercial programme of SA Rugby/SARU is on a sound footing and working effectively. It is important that things go well in this department. 2. Our relationship with our sponsors is also on a sound footing and we have forged a very close working relationship. There is still room for improvement, but generally I am happy. 3. I am very proud of what our Under-19, Under-21, Sevens and Springbok teams achieved on the field this year. The results talk for themselves. 4. If we are truly honest with ourselves and look at the development of young players, then we can be very happy. We just have to ensure that development in its totality is just as successful. We must continue to identify the young talent and develop them into equally good senior players ... bring them through the ranks. 5. If we look at head office in Cape Town, then I am very happy with what we have achieved throughout the year. Our marketing strategy is solid and financially things look good. Yes, there were problems, but the last couple of months things really looked up. A lot of people worked really hard. We now also have a very good relationship with the department of sport. 1. The absolutely negative publicity we received in the media all year (justified or not). It is very disappointing and not the kind of media coverage we would like to see. This kind of publicity does serious damage to rugby, both locally and on the international front. Yes, rugby is a high profile sport and we must do things the right way. We must look at our communication if we want to ensure rugby is the leading light in South African sport. 2. The loss of our bid to host the 2011 Rugby World Cup. I read about what people had to say afterwards and the reasons given for why we lost out to New Zealand. I just wish those people who express their opinions so strongly after the events, would put in more of an effort to help before the event. We had too much talk and too little action. 3. The development of talented black players and other young players. If we look at our development of these, we can certainly ask a few questions. I would like to see more black schools take part in rugby and see more people show an intense and passionate commitment to proper development. 4. The performances of our teams in the Super 12. It is bitterly disappointing to always see our teams at the bottom of the standings. For a country with the number of players we have and the structures that we have, we should perform a lot better. We are spending too much time making up excuses afterwards and not enough time putting structures in place to ensure we win. 5. Those provincial unions that struggle financially. It is a big worry to me that so many unions are not making ends meet. We want rugby to be played everywhere in the country , but we have to look at ways to serve the game so that it is financially viable and that those unions don't go under. We need more people to get involved in running and serving the game, people who make a contribution and not just standing on the side pointing fingers. 1. It is time to clear the archives, wipe the slate clean. We must stop riding on a wave of other people's mistakes and put our shoulder to the wheel. It is time we stop fighting with each other and work together. 2. I would like to see the game grow, but not just on the field. I would like to see significant growth among the black communities. I don't see those people at the stadiums watching the games. We are asking for full stadiums, but we want all communities there. 3. It is important that Jake White and his team do well in all aspects of the game, especially as we start looking towards the 2007 RWC. The players know where they stand and how they have performed, they know when they play badly. It is vital that every person gives his all for the team and make a contribution. We want the country to be behind the team and its management. We don't want the team to be a political pawn in other people's games. 4. I want our teams to do well in the Super 14. I feel it was the right decision to expand to 14 teams. The opportunities are there now for more players and we must take these opportunities. It is important, with a view to our contract with Newscorp, that we produce performances on the field that will make the country and the rest of the world proud of our teams. 5. I hope that we do not appear on the front pages of the newspapers and other media outlets for all the wrong reasons. We must allow the game, the on-field action, to do the talking in the media. The supporters want to hear about rugby, the action on the field. People don't want to hear about of-the-field action. Damn ,it shoulda read RIMS!